Do we really need another movie about the mentally ill? About stalkers? About desperate, unbalanced, lonely, psychotic people? There's no way I can tell you that One Hour Photo is about anything new, but I can tell you that it's like nothing you've ever seen before. Sy Parrish (Robin Williams) is a quiet and lonely one-hour photo tech hidden away in the recesses of a local Wal-Mart clone. He has no friends, he has no family; at least not in the real world. In his head, he has the Yorkins: A beautiful and photo friendly family who develops their pictures on nearly a weekly basis at his store. 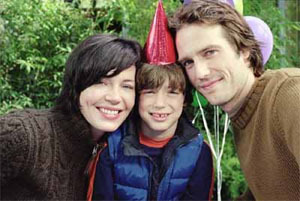 He watches them age and grow, fantasizing that he's a part of their picture perfect world. But, as Sy himself says in his opening narration, “No one ever takes a photograph of something they want to forget… When we look through our photo albums we’re seeing a record of only the happy moments in our lives.” Sy's obsession with the Yorkins grows and he learns about what is beyond the pictures he treasures, pushing him closer and closer to the edge. 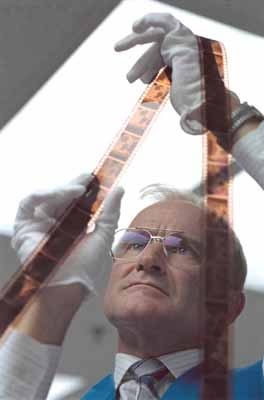 One Hour Photo is a beautiful and deeply stylized film in which symbolism and layer don't just serve as background filler, but help develop the characters themselves. For instance Sy's store, SavMart, isn't just some Wal-Mart retail clone. Director Mark Romanek has made SavMart into what every Wal-Mart or Target WISHES it could be. If heaven were a discount mega-mart, heaven would look like SavMart. Filled with excruciatingly clean whites, perfectly stocked and color co-coordinated shelves, SavMart's cleanliness and almost painful orderliness is a deep part of Sy himself. Williams really manages to bring the blaringly bald but blonde Sy to life without shying away from the deeply disturbed nature of this man (and his hair). The result is a surprisingly creepy and disturbing film in which the hated villain is just a cold, lonely, and damaged man. Sy only wants what everyone wants. When his idealized family falls apart, so does he. In sharp contrast to the dark and unsettling Sy, is the object of his idealization, the Yorkin family. So perfect in appearance are they that their existence could almost seem hard to swallow. But it’s merely an appearance and the failure of that almost unrealistic perfection feeds directly into the flawed nature of Sy himself. The only real problem with One Hour Photo is the incredible lengths Fox Searchlight seems to be going through to keep people from seeing it. There’s no reason this film shouldn’t be getting a major marketing push and a much larger release. I spent hours in line outside the only art-house in Dallas showing this flick, waiting and struggling for my chance to see One Hour Photo. I doubt many others will go through that kind of trouble and after the hellishly hot and mildly miserable line experience I went though, I almost wish I hadn’t either. If it never does get a decent release, keep your eye on DVD release for one of the most stunning and subtly creepy films released this decade.